The Northern Lights pattern by Jinny Beyer is a dramatic paper-pieced quilt with a unique secondary pattern. This paper piecing class breaks all the rules…less work, more fun! Have you ever stared at the notions wall and wondered what all those tools do and which is the right one to buy? Then Lisa is your Tool Time Girl! This entertaining and informative lecture features over 30 of Lisa’s favorite tools and corresponding quilts. Of course, there will be rulers, and cutters and marking devices—but be ready for a number of exceptional little gems along the way! 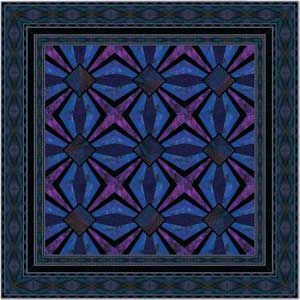 Lisa, a pattern author, retail buyer and quilter with over 20 years of quilting experience, will captivate you with this clever, instructive presentation. She has interesting stories and tips and tricks to interject throughout the presentation and it’s always fun and entertaining. Lisa will also bring a number of “tools” to sell.